“Such is the permanence of Manto’s works that the artistes making the cinema disappeared into an ephemeral mist,” writes Tapan Mozumdar. When I was about eight, we lived in a by-lane of an erstwhile fisher’s colony, Machua Toli, of Patna. My parents had to move away from the joint family we lived in there. Irreconcilable differences, you’d say in today’s parlance. There were tears, seethed in anger, streaming in vulnerability that parted an address of intimacy into torn realities. That was my first sense of partition. I missed my playmates, two sons of a rickshaw puller and a housemaid, and the courtyard in that otherwise dark home where I rode my tricycle and intimidate my aunts of riding over. In our new, rented home, we lived with the strangers, with a veranda and a toilet shared with the other tenants. Soon, I learnt to play in a no man’s land next to our rooms, all alone, and made up three imaginary playmates, Rakhi, Sukhi and Bhutkarua. I am amused to realise that after about five decades, I still remember those names exactly. Maybe, because they gave me company for three years, during the noons after my morning school when my mother would be tired and asleep, during the evenings my father would be working late and I would wait for him after finishing my homework. Those were my first fictional characters, protagonists or hero’s friends in many roleplays I told myself, modelled after the kids I had to leave behind in that by-lane of Muchua Toli. Manto lived a partition as well, much real, bloody and unnecessary than mine. He was as helpless as I was. He realised that the people closest to him were drifting away just because he belonged to the ‘other people’. The eyes of Nawaz, playing the role, reflected my torment, looking at Bombay for one last time and then, at the ship signalling to set sail for Lahore. Fortunate would be the literary readers that Manto was not eight at that time. Doomed was he that he was not eight while crossing the line. He was destined to carry the cross that forever split his being into two nations and uncountable characters wedded to his fiction. He was a rebel, or so it would seem. His nightmares, tears behind the door of a prison, anxious observation of a spider climbing up the rods and failing, then trying again, and dropping down were only for Safia to see. Safia, his friend and wife, the mortar that kept him together, was always with Manto through those human moments. She loved the animal Manto for whom the civil norms of the timid never made sense. She cared for the messiah whose only religion was truth. She knew how Manto went in and out of his stories, aimless, easy but always honest. Nandita has captured these transitions the way Manto would have felt himself. Rasika as Safia breaks down on two occasions, gets angry on one but never ceases to love, and live, Sa’saab. 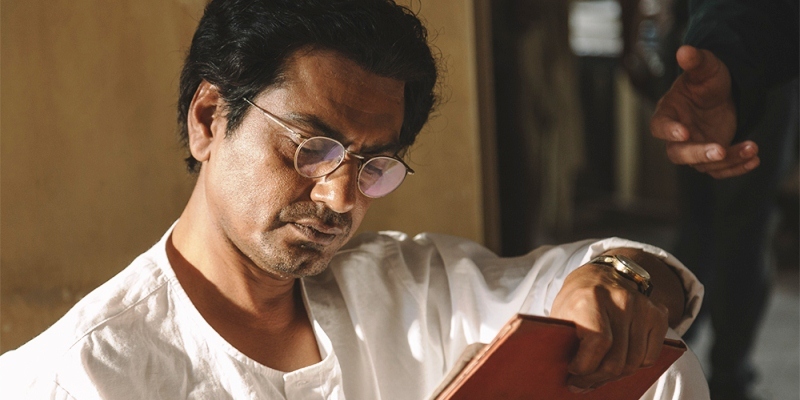 Flashes of potent geniuses pass before you during the 112 minutes of the film, Paresh Rawal, Javed Akhtar, Rishi Kapoor, Divya Dutta, Vinod Nagpal… they pass like the stations that Manto might have crossed during his train rides between Lahore, Amritsar and Mumbai. That was before he got scared, before he ran away, before he felt as vulnerable as the millions who ran and were not blessed to live and bleed their shame and fear on blank pages. Manto joined the exodus for his own sake, for the sake of his family that he adored. He couldn’t afford to stay put. Robbed of the land where his parents and the firstborn were buried, Manto could never forgive the senile political class and a bankrupt, rushed imperial power. The people he saw vanquished, and killed, and raped, and sold around, pleaded with him to write about them. He obliged them, much as his sober psyche could take. Manto’s potent words and characters ate up Nandita, Nawaz and a host of brilliant technical experts (sound, cinematography and art direction, three cheers!). The film couldn’t rise over the writer. The past of Lahore of 1948 is such high definition, that sitting in the chilled auditorium (eighteen people watched the second show, I counted) in Bangalore of 2018, I could smile, laugh and be angry with Manto. Such is the permanence of Manto’s works that the artistes making the cinema disappeared into an ephemeral mist. It didn’t matter that the celluloid version could become a reality after six anxious years of wait and passionate hard work. His signature shone. From right to left, alive in the audacity of a pencil that preserved the Sheaffers and Parkers he never needed to use, in the letters that could make pearls feel humble, it read ‘Saadat Hasan Manto’. Insaniyat zindabad. Afsana nigari zindabad. Tapan Mozumdar is a Bengaluru-based writer and storyteller.